UPDATE - Sept. 9, 2015: Registration for “Send Your Name to Mars” aboard InSight is now closed. Visit the Send Your Name website to be alerted to future opportunities. 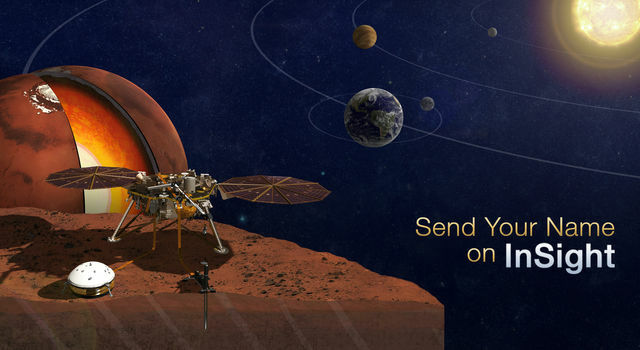 The next chance to send your name to Mars will be aboard Exploration Mission 1. Send your name to Mars on NASA's next journey to the Red Planet! Visit the Fly Your Name page by September 8 to have your name added to a silicon microchip headed to the Red Planet aboard NASA's InSight Mars lander. The InSight mission is scheduled to land on Mars on Sept. 28, 2016 to investigate the deep interior and seismology of the planet. This is the first time such a study has been done on Mars and scientists are hoping it will uncover important details about Martian quakes, the interior structure of Mars and the evolution of all rocky planets, including Earth. Participants in this fly-your-name opportunity will earn "frequent-flier" points as part of NASA's Journey to Mars campaign. Started with the December 2014 flight of NASA's Orion spacecraft, the campaign offers several opportunities to send your name to Mars -- and collect points -- on NASA missions preparing for human exploration of the Red Planet.